The facts, when they come to light, are dreadful and shocking. Fast fashion and sportswear multi-nationals have been polluting the groundwater and potable drinking supplies around their factories for decades. They are effectively treating rivers and streams as their own private sewers. The waste products from their manufacturing processes is toxic. In some cases, carcinogenic. And they've been dumping it straight into the water that local people use for drinking, cooking and washing. That's the bad news. The good news is that we are starting to find out about it. Thanks to groups like Greenpeace and their Detox campaign, environmental abuses from the biggest names on the High Street are coming to light with increasing regularity. As people find out about what these companies are up to, they start to tell their friends and family. And the word gets out. All of a sudden, that sportswear company isn't known for their charity work or sponsorship deals. They're the people that turn rivers red with toxic dyes. Social media has become an incredibly potent campaigning tool, and it's proved to have remarkable results. Thanks to the Detox campaign and others like it, many multi-nationals and fashion houses have pledged to overhaul their supply chain, removing toxic chemicals from the manufacturing process by 2020. There's a long way to go, but that's a massive step forward, and shows just how much power we as consumers have to enable real change in the fashion industry. Here's a video from Greenpeace that talks about Detox, and where we go from here. Like many writers, I tend to survive on a healthy, balanced diet of caffeine, instant noodles and the gnawed nubs of my fingernails, especially when I have a deadline looming. On those odd occasions when I do emerge blinking into the daylight, it's good to get something of worth and substance down my neck. Juice bars are a bit of a lifesaver for lazy hacks like me. Real, fresh fruit juices are a brilliant way of topping up your five-a-day without having to go through all the tedious grunt-work of chewing. I've been a regular visitor to the Fuel Juice Bar in Reading for a couple of years now for a quick blast of wheatgrass and kumquat. Imagine my pleasant surprise, then, when I discovered that Pier32 have been supplying shirts and aprons for Fuel since 2007, and that we're helping out as the business undertakes a pretty rapid expansion from thirteen to twenty-five stores. 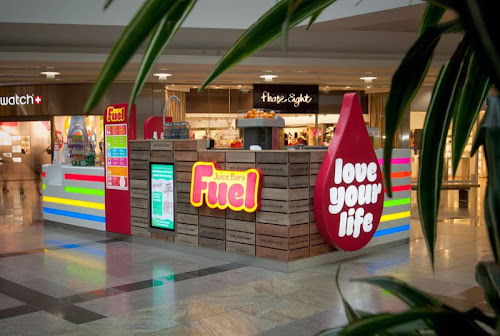 There will soon be a bunch of new Fuel Juice Bars up and down the country including, I'm happy to report, one in Pier32's home base of Kingston-Upon-Thames. With the growth of the company comes a fresh new design and uniforms, which Pier32 were happy to supply. It's good to see a young business doing well and pushing forward, and it's a great sign that Fuel have chosen an ethical path for their expansion by using Pier32 to supply their branded uniforms. We wish them luck, and happy juicing! Fuel Juice Bars choose mens and womens t-shirts from Skinnifit, soft-shell jackets from Russell Jerzees and short bar aprons from Premier, all available from the extensive range of customisable clothing by Pier32. It's been a week since thousands of bloggers united under a common cause, and used Blog Action Day 2013 to celebrate human rights, and to highlight the work that still needs to be done in order to halt abuse. Over 2000 bloggers from 130 countries took part. It's a big subject, and unsurprisingly there was a wide range of coverage. From examinations of the Universal Declaration Of Human Rights, to a horrifying expose of the countries where stoning to death is not just tolerated but legal, the day had it all. Here at The Pier we were blogging too. I talked about the work that needs to be done post-Rana Plaza to give Bangladeshi workers a fair deal: if you haven't read the piece yet, it's here. But as part of the alliance of like-minded writers uniting under the banner of the Human Friendly Fashion Bloggers, I wasn't alone in stepping up to the plate and firing off a home run of a post. In fact, there were over a hundred of us talking about human rights in the fashion industry on October 16th. Ms. Wanda has a run-down of her favourites (I'm extremely happy to note that my piece got a mention), and there's some absolute humdingers in there. My personal favourite was from Green Issues by Agy in Singapore, with a searing indictment of what sand-blasting jeans can do to workers. Many people don't even realise that this still goes on, and that it's casing dozens of completely un-necessary deaths and illnesses each year. Our Twitter chum Kendall from Kindness By Design used her keen eye to dig out the best human-friendly clothing around, and I would be remiss in my duties if I didn't mention the winner of the Best Human Friendly Blogger Award, which went to Mancunian Vintage and her personal account of how she became an ethical fashionista. The event was a huge success, and it goes without saying that I'll be back with my human-friendly colleagues next year for more of the same. Hope you can join us. Until then, human friendly fashion blogging continues here at The Pier twice weekly, three times if I'm feeling particularly feisty. When I was younger, I wanted to run a record shop. It would be a cool, calm but welcoming place, somewhere where you wouldn't get sneered at for liking chart pop, but with the knowledge to help you when you wanted to move on up. There'd be a little coffee bar next door, and we'd sell t-shirts. I never did find my perfect shop, and with the state of music retail these days, it's probably just as well. But I've found a place that has just that vibe. 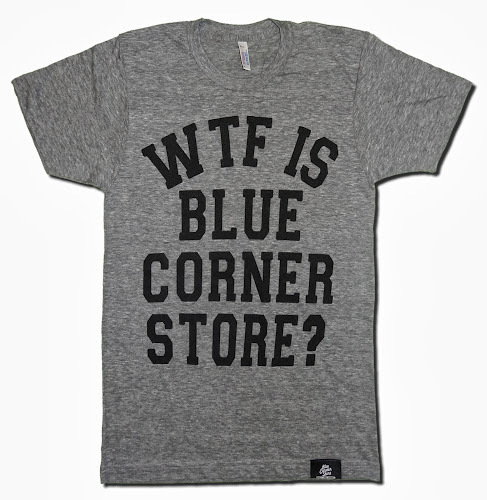 The Blue Corner Store started life as your typical snarky indie music blog. That snark's still there of course: any music blog worth reading needs edges sharp enough to cut yourself on. But the writers have mellowed enough over time to be able to include reviews of the new Miley Cyrus album without starting from the assumption that it's worthless. It's a lively, informed and informative read. More importantly for our purposes, the Blue Corner Store sell a carefully-collated range of clothes. That's where Pier32 come in. The Blue Corner boys insist on an ethical approach for all their sharp, retro designs, and we fit the bill perfectly. We supply most of the items they stock, ensuring that their clothes are investment pieces: built to last and supplied from eco-friendly, sweatshop-free brands. The Blue Corner Store has just launched a new range, while hanging onto all their favourites (the Quiff Skull T is tricky to keep in stock apparantly, it's that popular). Now's the time to pop over and check them out. I recommend a browse at the blog as well. You might just find your new favourite band. The Blue Corner Store uses American Apparel T-shirts, hoodies from AWD and sweatshirts from Continental. Click through for more details on these best-selling ethical brands. At Pier32, we believe in doing our bit for the environment. I've always seen emerging technologies as a way of becoming smarter about the way we handle our needs, as we move into a century that's likely to have some major challenges to the way we live now. For example, did you know that lighting can account for up to 25% of a building's energy costs? With the advent and development of LED technologies, it should be a no-brainer for businesses to replace their lighting with newer, cleaner solutions. But take-up is slow. No-one wants to suffer the downtime of putting in new lighting structures. And of course, there's still a stigma attached to low-energy bulbs: that they're unreliable and take forever to come up to full luminance. I'm happy to report that those rumours are very old news, and that putting in new eco-friendly lighting is a lot simpler than you might think. But tell you what, I'll let this nice chap with the Pro-Markers write it all down for you. The benefits are obvious, and we're putting our famed customer service to bear, making sure that fitting LED Eco-lights is a low-fuss installation that starts saving you money and energy from your first bill. It's an exciting new venture for us, and we think it fits in with our mission to bring an eco-friendly message to businesses across the UK. If you'd like to know more, visit our dedicated Eco-light page or just chat to Gerry The Voice directly. We think LED Eco-lights are a brighter way to help lighten your energy bills. We hope you'll agree. The following piece has been written for Blog Action Day 2013, as Pier32's contribution to the Human Friendly Fashion Bloggers consortium. Find out more, including links to all the other bloggers taking part, here. What happened next was shocking. Rather than admit culpability and offer compensation, many of the companies involved, including global heavy-hitters like Walmart, Primark and Gap insisted that they had nothing to do with the disaster. It was only when news footage of clothes labels in the rubble, clearly showing their names began to appear that their tone changed. Because what we want is simple. We want workers the world over, from Newcastle to Nairobi, from Dhaka to Darlington, to be treated with respect and concern for their well-being. We want them to be paid a fair wage. We want them to have a say in how the business they contribute their labour to is run. And we don't think a factory floor is any place for a nine-year-old. It's not much, in the great scheme of things, and if it means we have to pay another quid or so for our clothes... is that a price we're not prepared to pay? I'm Rob Wickings, and I'm a Human Friendly Fashion Blogger. Thanks for listning. Now say something. "I've lived amongst people in poverty, too, in their houses and with their families, walking alongside them, literally and organisationally. But I could always leave. And in the toughest times I've been aware at my core that my British passport, my connections, the colour of my skin and being a man are insulators from the worst. I will never understand the tyranny of a hungry belly. I'll never fully understand exclusion." I completely get this argument. I have all the benefits and powers that are part and parcel with being born into citizenship of one of the most powerful and richest countries on the planet. I want for nothing. I'm well-fed, clothed and sheltered, and my employer treats me with respect and pays me well. I'm not as well-off as Ben, perhaps, but on the global scale I'm absolutely one of the 5% richest people in the world. How, then, can I write with any sort of authority about people who have next-to-nothing, who don't know where their next meal is coming from, who face abuse and worse at their workplace... if they're lucky enough to have a job in the first place? The simple answer is that I can't. I will, fingers crossed, touch wood, spit and whistle, never know the suffering that the workers of Chinese and Bangladeshi clothes factories face on a daily basis. I pray that remains the case. I wouldn't wish that life on anyone. And therein lies the point. I may not know how tough they have it, but I can empathise the hell out of the situation. I may not know how to lace a loom or run a sewing machine, but I understand that anyone that does has the right to be treated with the same level of respect that I have at work. Yes, I am a very lucky man. I try not to take any of my advantages for granted. Because I have a little skill in stringing together words into sentences, and sentences into paragraphs, that's what I do to try and tilt the balance, however imperceptibly, back towards level. I donate where I can. I agitate when I can. I make noise, and bang a drum to bring attention to the abuses that are part of so many people's lives. It's not much, in the scheme of things. But it's a start. As a lucky, healthy, well-off white male, I'm right at the top of the privilege tree. Being aware of that, like Ben, is the first step towards using the leverage you have in the interests of positive change. Doing nothing, or complaining about my lot in life? Now that would be a crime. And it's one that I have no intention of committing. Every October, thousands of bloggers around the world join together for one day to highlight a cause and make some noise about it. It's called (logically enough) Blog Action Day, and this year the theme is Human Rights. The View From The Pier is joining in. We're part of Ms. Wanda's Human Friendly Fashion Bloggers network, which is an affiliate of the greater, over-arching Blog Action structure. We're in good company too. The HFFB includes high-calibre writers like Ceri Heathcote and Kendall Benton of Kindness By Design. All of us will be talking about human rights and fashion on October 16th. For me, I really don’t care if my dress has been made with recycled polyester, if the person who made it is being sexually abused, not paid a living wage, or having to endure unbearable working conditions. If you're a fashion blogger, it's not too late to make your voice heard! Join our merry band at the link below, where you'll also find a resource kit to help you make the most of the day. If you're a reader, then please join us on October 16th, and let's talk about fashion, human rights and how we can make a difference. Pamela Ravasio at Shirahime (one of the best ethical fashion bloggers out there, always worth your time) has pointed me in the direction of a story that shows how eco-fashion can frequently be all about the rediscovery of old techniques and methods, and melding them with a modern approach. In 2011, sewing machinist Daniel Harris (no relation to the famous tweed makers, but you have to love the coincidence) found a rusty old loom in a shed in darkest, rural Wales. He fell in instant love with the heap of old tech, and brought it back to the studio space that he'd just bought in East London. He couldn't get it through the door. In taking it apart and putting it together in order to house it, Daniel's admiration for the intricate machine grew. Over a period of a year, he taught himself how to use the machine, and how to weave cloth with it. Daniel found himself on a mission, and bought more machines, the oldest dating back to the 1850s. He bought them back to life, and realised that there was a deeper purpose shining through. Is it coincidence that Daniel's name is what it is, or that he somehow set up shop in an area once famous for textile production? Perhaps, but the fact remains that in a warehouse space stuffed full of samples, bolts of cloth and antique and lovingly restored machinery, Daniel Harris is doing something wonderful. 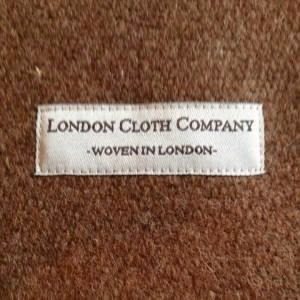 The London Cloth Company specialises in cloth woven from British wool. As 97% of the wool we see in this country comes from Australia and New Zealand, this is a big deal. Daniel has built up relationships with a network of Welsh and English farmers, which means the wool he buys has impeccable provenance. You can trace his wool down to the flock from which it was sheared. Better yet, the wool is undyed, yet retains a great variety of shade and hue. From herringbone to dogtooth check, there's a whole lot of colour in London cloth. Daniel is a one-man operation, yet the quality of his cloth is making a big reputation. He exports to markets as far-flung as Sweden and Japan, and has provided cloth for Ralph Lauren. His short-run custom tweeds are ideal for designers and private clients looking for something that bit different and special. He's small-time compared to the industrial yarns of Scotland, pumping out tweed by the kilometre. But London Cloth has little in common with the faux-nostalgia boom, despite attempts by some journalists to label him as some sort of hipster. Daniel Harris is working with machinery and methods that, despite the hard work, boredom and pain involved, produces material that has value beyond the surface. His cloth has enviable eco-credentials, and he's doing things in his own way... the right way. We need more craftsmen with the grit, determination and vision of Daniel Harris. Half mad inventor, half evangelical missionary, he has created something with solid links to the past, and a firm eye to the future. Now, if you'll excuse me, I need to talk to my tailor. Daddy needs a new suit for winter. Reycling is one of the most important ways in which we can cut down on waste going to landfills, and drop energy emissions from manufacturing. But it's becoming clearer that we can do more to help out old Mother Earth, by simply going through our wardrobes a little more often. A new report from the American Environmental Protection Agency (EPA) claims that recycling of old clothes and textiles is a highly significant way of reducing greenhouse gases. According to the study, it has the impact of taking a million cars from the roads, and more than four times the impact of glass recycling. And yet, only 15% of waste textile products find their way into reycling programmes. "Local governments need to capitalise on the positive environmental impact of clothing recycling programmes not only as it impacts greenhouse gases, but how it can also extend the lifecycles of landfills. "The message the public needs to hear is 'Donate, recycle, don't throw away' when it comes to their clothing and household textiles." The EPA would like to see textiles become a "top-of-mind" recyclable, in the same way that glass, plastic and paper are today. For that to happen, though, there will need to be infrastructure changes. Donating old, clean clothes is becoming easier, with clothes-bank hoppers outside many stores and supermarkets. But it still isn't as straightforward as dumping a washed can into the green bin. And what about my old socks with the holes in them, or the t-shirt that I just can't get the red-wine stain out of? These are clearly not donatable items, and yet they can find new uses if broken down into their constituant fibres. Fabric recycling is a great idea, and I for one am fully behind it. But for it to take off, the process needs to be a no-brainer, something that can be rolled into your everyday routine without extra work. Once that happens, then we could all really start to see the benefits.